I am happy - finally, I read "The End of Poverty" this month. I came across this book on several occasions. But i did not get the urge to read till this year when I have to go through "professional dilemma" that is directly the result of fair understanding of how the "machinery" of global health agenda functions. The global health agenda that is rooted in inherent conflict or friction as a result of our notion of developed versus underdeveloped countries in terms of poverty, inequalities, outbreaks, civil unrest, instability, hunger and so on. In this background, a question must come, why should we face a professional dilemma? Rather - we need to better equip and dedicate ourselves to deal with the existing and "would be" challenges that are surfacing around us. For examples - Haiti Cholera, West Africa Ebola, Seoul MERS, just recent ZIKA in South America. Well, exactly we are right but are we professionals from low income countries capable to tackle with such problems that has shaken pretty hard the global health security. From my personal experience - we damn have to work hard to earn an professional respect and confidence to be taken in in a team. Well - we may tell "just a gibberish" well - I am sharing this experience of mine for my own personal justification or valid reason. Time will tell !! What I think - it may be one of the reasons for my personal experience of "subtle cornering", which has to be linked to our "preconceived" ideas of what and how developmental partner organizations should be working to support poor countries in South Asia and Sub Saharan Countries. Myself - I have come all the way through lots of struggle to work in an organization that has a vision and mission to serve those communities living in utter impoverishment. However, I have to say honestly that after almost five years of struggle to assert a place in an competitive environment to be involved and heard within the team received deaf ear !! Well - it is always sometime the best strategy to delve inward and figure out what went wrong and what is supposedly to be improved in order to assert your place in the work place. Honestly - it did not work out despite many attempts so started to wonder what could be the reason that you are always "cornered" and "pushed aside" when your are supposed to be getting a place to utilize your knowledge and experience for what you paid for. Then - it is hard to say - but i began to realize that it should be the case your "competencies" and "origin" that sometime matters and the kind of "subtle" discrimination unless proved otherwise !! Thereafter - I began to realize - the functioning of international organizations (not all) does not go the way as per vision most of the time (Here - I say this is all personal thoughts and free speech allows me to express and share). I know this is too harsh to say but this is what Jeffrey Sachs also says in his book. Acutely - have I felt that your origin and competencies do matter !! So - you may again ask why professional dilemma? Well - for me - my simple assertion is how could you work with a team that sometime undermines the very public health ethics, which should enable us to respect the professional ethics that incorporate diversity and "differently" abled, competencies or even say background are also given space to grow? With this recent dilemma and also an assertion to voice you concern - I have begun to realize since our motherland is where after all we are connected and going through "dire" situation of instability, mismanagement and confusion that I realize I will put on some of my time to understand through reading and writing - "why we are in a situation that we are now in this 21st century? For us to get a clear answer - there is no ready made answer, instead we need to dig down into relevant books from available literature. That is how I have decided to read and write on "the business of poverty" as an thought experiment. The poverty trap: The name itself is self explainable that poverty itself leads to perennial poverty like we are trapped in quick sand. In terms of economics - when we are extremely poor then we are so poor that whatever we earn would be spent for our daily needs. There will not be any left for saving so we save some wealth and invest in land or do business. On top of it - those unfortunate people will be victim of all illness from infectious diseases, violence to all possible ills in the society. 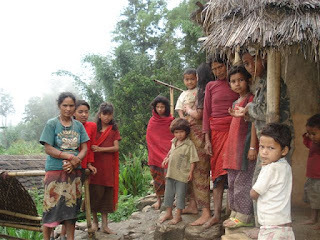 For this we can take an example of "Badi" community in Western part of Nepal, where significant proportion of population are still living with extreme poverty. Physical geography: Well - this is also one of the key reason but I would say that this can't always be the only reason because there are also some example like Switzerland which is a developed nation. Nonetheless - the physical geography most of the time put us in disadvantage, which is echoed loud and clear in recent "unofficial" blockade that Nepal as a landlocked nation had to face despite lots of voices against "rash" behavior of India in local as well as international arena. This would not have happened should Nepal had sea port. In this way - there are many "landlocked" countries at utter disadvantage due to their geographical location and position. On the contrary - some analyst say that the key reason for Singapore's immense development is primarily location , location and location. Howver, I would say - it could be one reason but it is not the only reason, since Singapore was fortunate enough to have dedicated and qualified leader like Lee Kuan Yew. Fiscal trap: I think, Nepal could also be one of the best example for fiscal trap. Every year - we are repeatedly facing the same fate knowing that you land in the same "pothole" every time. This is utter foolishness but there is a need for strong political leadership with " robust" governance to address this problem. Governance failure: I would say this is the primary reason for the case in Nepal. The failure roots back to our philosophy of daily undertaking to our habits that have been molded by our education and training. After all - it is from within us that all those representing only our government (permanent and temporary) originates from so I believe that governance failure roots within our our nation state and community. To address this factor, it is only through education and strict discipline implemented though governmental policy and law enforcement. In this respects - the leaderships should lead by example. In contrary - that is not the case in many poor countries where political powerhouses and government machinery is mired in corruption that has infected every sphere of the society. To treat such malaise of corruption rooting in the society as "malignant cancer" needs intense chemotherapy with surgical encapsulation if necessary. Cultural barriers: In a way - this could be also a reason but should not the sole reason. Sometime we tend to say - our country is poor because the very reason for our circumstances is rooted in our 'lazy" culture and say religious misguidance. One thing i could say that for sure - that "untouchability" is one social or cultural illness that put huge population at social and cultural disadvantage whereby they are never given a chance to rise in the community. In this respect - Dalit community, who occupy one third population in Nepal, would be one example to mention and would be justified by evidence and even the constitution. Geopolitics: Sure, this could be one reason which fits well for Nepal. Sometime - it is said if your have neighborhood that is always in conflict or in friction or sometime i would say that your neighbor continuously undermines your existence then your existence would be pretty challenging. So is the condition for particularly many landlocked countries like Nepal. This was proved beyond doubt by recent incident between Nepal and India. Lack of innovation: Sure - this could be one reason but for our circumstances this factor would not weigh much significance when we are struggling for basic needs so "innovation" would be a distant dream. Demographic trap: Yes - demographic trap could be one reason that it is said that "if the community is poor then there tends to be more children's deaths and for that reason there tend to be more children to compensate for deaths and also some people reason that there tend to be more birth in such community because mother's education status and also social pressure leads to more children thereby increased population. That means, increased population with dire poverty would be unfavorable for economic and health well being in the community. Now, after reading these two great books, I am of the opinion that any public health professionals or even scientist or project managers / administrators, who believe they want to contribute in the global effort to alleviate poverty related illnesses must read these two books to start with. The reason being - it is through our own personal experiences and realization of how people especially children and mothers have to suffer the hard reality of hardship, hunger and diseases in remote hard to reach communities. To explain a bit, let me share a recent example that I personally felt as a revelation while on a duty trip to Nepal. Here for the shake of confidentially - I will refer a person as X, who seemed a changed person after visiting a remote village in Nepal. X used to be very arrogant and too untamed to have a meaningful dialogue. X was raised and educated in a developed country and had never seen " grave illnesses" and extreme poverty from close. This lead always to confrontational dialogues while discussing about any project or program that related to low income countries or community. So - somewhere - we managed to convince X to visit a community for a few days and see the extreme conditions closely. Amazingly - that one week of stay in the community has transformed completely and I hope such transformation in outlook remains permanent. In this way - many administrative staffs from particularly developmental related organization (that works for poor countries) must be given a chance to closely understand the poverty and its effects that reflects in suffering as a result of cholera, typhoid fever, MERS, DENGUE and so on.